Not a home match, but a challenge: About the first communication activites for the project. To tell you the truth: When we got the message that PASCAL had won one of the main awards of the DFG Ideas Competition for International Research Marketing we were excited, but we were also a little bit worried. To make the project known to the African geo-science community as well as to the media – this wouldn’t be a home match for us. No, not at all. Okay, what can we offer? Our strong point is the relevance of the project. It aims to support Africa in implementing the latest geo-scientific methods to make food production sustainable and secure. It offers young African scientists an opportunity to become familiar with these research methods and to meet leading German science partners. In short: This is a project with a meaning and with a message – and this is what communication people like us love. But in order to communicate these strong points we can’t rely on our German media networks and partners. We need support from people acquainted with the local situation, involved in local communities and connected with local networks. But who could be our multipliers, our advisers, our door openers? The lack of a communication bridge to media and multipliers in Africa could be a weak point in our communication efforts and we knew we would have to work on it continuously. To start with we decided to do three things: Firstly we started a call for applications for a journalistic scholarship. And please don’t hesitate to help us with distributing the call! Secondly we started writing this blog as a kind of project diary or communication interface. Our idea is that with this blog people can follow the project’s development and perhaps find helpful information when necessary. But we hope that the blog also opens a window to come into contact and start a dialogue. Thirdly: We looked for solutions for our various problems – and surprise, surprise! : There are signs of hope. For instance, our media editor Marcel detected some social media groups located in Africa who could help us circulate the call, for example the Department of Journalism at Stellenbosch University in South Africa, which has already shared our journalistic scholarship offer on its social media pages. Due to Marcel’s effort we caught the attention of Mandi Smallhorne Kraft, who is president of the South African Science Journalists Association as well as the African Federation of Science Journalists; she will share information about the journalistic scholarship with members. This is wonderful, Mandi! 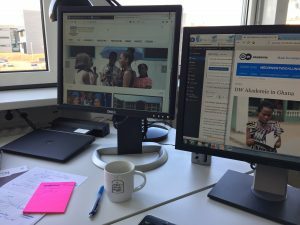 Erhard, our editor in charge in this project, got in contact with the Ernst-Brost-Institut für internationalen Journalismus in Dortmund and they promised support. Encouraging signals he also got from DW Akademie, DAAD, the German Academic Exchange Service, and GIZ, the German government’s provider of international cooperation services for sustainable development and international education. He got in contact with Timothy Quashigah from the Ghana Institute of Journalism in Accra, a senior lecturer and Head of Broadcast Journalism Department. He promised to “spread the information regarding the scholarship … to as many journalists and journalism trainees as possible”. Thank you, Tim! We know that these are only our first steps in making PASCAL glow! So if there is anybody out there reading this post and wondering why we don’t get in touch with one another: We look forward to hearing from you!